105℃, long life, low impedance. Large can type, snap-in terminal type. The capacity is 10000uF, enough to meet your basic need. High precision and stability, very convenient and practical. Suitable for a wide range of electronic applications, quite good accessory for DIY. ELECTROLYTIC CAPACITOR: The capacity is 10000uF, enough to meet your basic need. 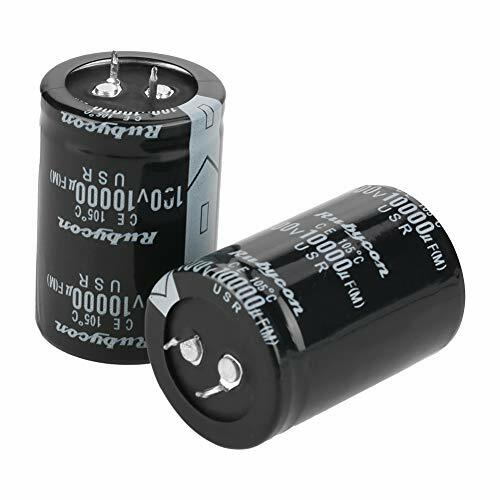 TYPE: Radial;Aluminum electrolytic capacitor with radial lead.Large can type, snap-in terminal type. POLARIZED : the longer lead is positive electrode while the shorter one is negative electrode. OCCASION: Widely used in electronics, such as computer motherboard, TV, speaker, digital camera, etc. High precision and stability, very convenient and practical. SATISFACTION GUARANTEE: We care for every customer's feeling.If this product does not meet or exceed your expectations,Please contact us at any time.Suitable for a wide range of electronic applications, quite good accessory for DIY.